AMD has released the final specifications of its upcoming Radeon RX 470 and Radeon RX 460 GPUs, which fall below the Radeon RX 480 to flesh out the company’s 2016 graphics product lineup. The two new GPUs were earlier announced at this year’s E3 gaming expo, though details were light at the time. The Radeon RX 470 is a cut-down version of the RX 480, codenamed Polaris-10, with some of its components disabled, while the RX 460 is based on a smaller chip codenamed Polaris-11. While the former is aimed at gamers who want the best performance in today’s most challenging games at 1920×1080, the latter is aimed specifically at esports titles which are typically less intense. The Radeon RX 470 will be available only with 4GB of GDDR5 RAM, as opposed to the choice between 4GB and 8GB that buyers get with the RX 480. Base and boost clock speeds have been dropped to 926MHz and 1206MHz respectively, and the total count of programmable execution units has also fallen from 2304 to 2048. AMD’s reference card design has a 120W peak power draw rating, compared to the 150W figure which put the RX 480 in a precarious position when it came to power draw. Reference cards will have three DisplayPort 1.3 outputs and one HDMI 2.0 port, with no legacy DVI port. They will also require a single 6-pin PCIe power connector which shouldn’t be a problem at 120W like it was with the reference RX 480. This later release also means that the RX 470 benefits from AMD’s recent driver development efforts which have already boosted performance and cut power draw for the Radeon RX 480, compared to its performance at the time of its launch. AMD is positioning the card at the $150-160 level (approximately Rs. 10,000-10,680) before taxes and duties), and promises 60fps at 1920×1080 in current games including Doom, Rise of the Tomb Raider, The Witcher 3, Fallout 4, and Total War: Warhammer. Exact pricing will be known when the card launches on August 4. The Radeon RX 460 is potentially more interesting because of its smaller, purpose-designed GPU. It will be available with either 2GB or 4GB of GDDR5 RAM, starting at $109 (approximately Rs. 7,275 before taxes and duties). Cards based on this GPU are designed to work without any external power source, making them attractive drop-in upgrades for people with pre-built or older PCs which don’t have adequate power supplies. 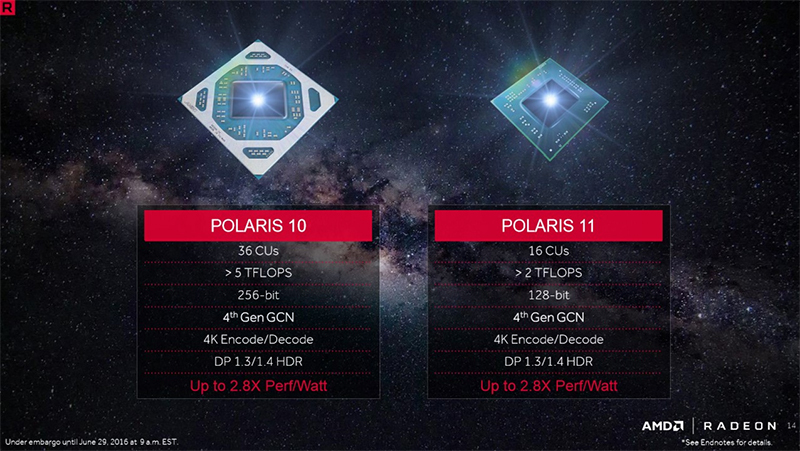 Polaris-11 is likely to be the basis of AMD’s laptop GPU efforts for this generation, and is a small chip which will run at between 1090MHz and 1200MHz. It has 896 execution units and uses a 128-bit memory bus. Total power draw is rated at under 75W. 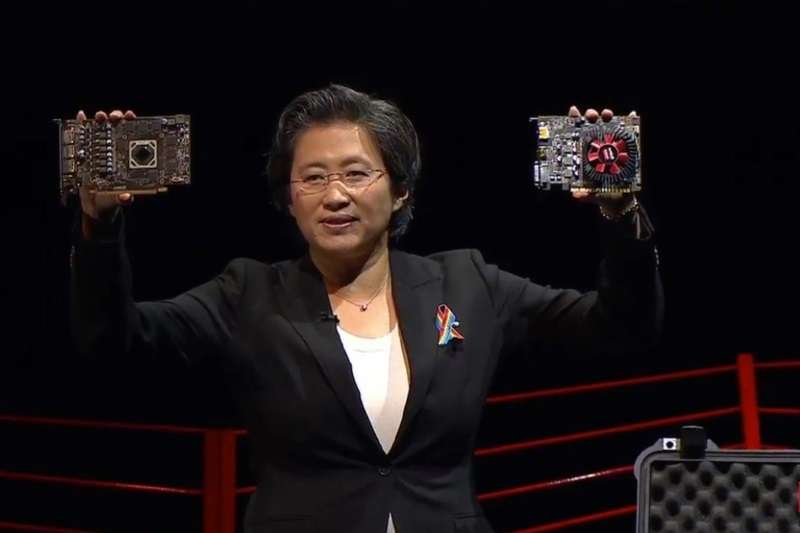 AMD’s latest renders show a slightly different product from what company CEO Lisa Su held up on stage at E3. The card now has a shroud covering its entire length rather than just a heatsink and fan over the GPU. The reference card also appears to have one DVI port, one HDMI port and one DisplayPort as outputs on a single-slot backplate, though the cooler is still tall enough to block two PCIe slots. These cards will go on sale on August 8. The Radeon RX 480 starts at $199 (approximately Rs. 13,365 before taxes and duties) and now has a suggested retail price of Rs. 20,990 for 4GB and Rs. 22,990 for 8GB cards, following criticism of its high launch prices and subsequent reductions to better compete with Nvidia’s GeForce GTX 1060. If the same conversion applies to these new products, pricing for the Radeon RX 470 and RX 460 should come in at around Rs. 16,000 and Rs. 10,000 respectively. That could put pressure on Nvidia’s GeForce GTX 750 Ti, 950 and 960, at least until the presumably inevitable GeForce GTX 1050 is launched.